Southern Africa has been plagued by water shortages in recent years. WLE has been studying and mapping the groundwater potential for irrigation, industry and household use. This resource, if managed correctly, has the potential to mitigate some of the water shortage problems. In addition, the potential of small scale irrigation schemes that combine both surface and groundwater can make the region more food secure and resilient to the impacts of water shortages. There is great groundwater potential in southern Africa but the general understanding of the availability and potential for the resource is poor, making effective decision making difficult. The sustainability and longevity of groundwater use depends on good management and governance. WLE has been studying and mapping the potential of the groundwater resource use for irrigation, industry and households. Providing the evidence base and tools for understanding groundwater quality and quantity can help mitigate major fluctuations in water availability and reduce risks for both urban and rural areas. By Hua Xie and Claudia Ringler of IFPRI. The number of food-insecure people in Africa South of the Sahara remains unacceptably high and is set to increase as a result of climate change and weak agricultural and economic growth. According to the 2018 Global Food Policy Report, an additional 38 million people are projected to be at risk of hunger in 2050 as a result of climate change-induced slowdowns and disruptions in agriculture in the region—25 percent more than would be at risk in the absence of climate change. It’s hard to manage something you cannot see – can we feed billions from the ground up? Irrigated agriculture can contribute to lasting deterioration of groundwater quality, preventing its use for drinking and endangering ecosystems and bio-diversity. If we're going to get global agriculture right, we'll need to promote good groundwater governance. Is groundwater the key to increasing food security in Sub Saharan Africa? Sub Saharan Africa is facing a food crisis due to drought. In the face of water and climate uncertainty, is groundwater irrigation the key to ensuring food security in the region? IWMI used an integrated management support tool called GRiMMS to assess and map the groundwater drought risk in the Southern Africa region. Groundwater drought risk refers to diminished groundwater access and availability. IWMI scientists have developed a map and inventory that shows the presently known transboundary aquifers in Africa. The map includes 80 aquifers and aquifer systems superimposed on 63 international river basins. CGIAR Research Program on Water, Land and Ecosystems (WLE). 2014.Transboundary aquifer mapping and management in Africa. Colombo, Sri Lanka:International Water Management Institute (IWMI). 8p. In May of 2018, Cape Town approached 'day zero' when the city was projected to run out of water. While there were major implication for industry, tourism and agriculture, drastic water management measures were able to avert this catastrophe. WLE researchers have been exploring ways to improve water management to reduce economic losses, particularly for smallholders. The project builds on important progress achieved earlier this year. In February, DAFNE held its first stakeholder workshop in Lusaka, Zambia. 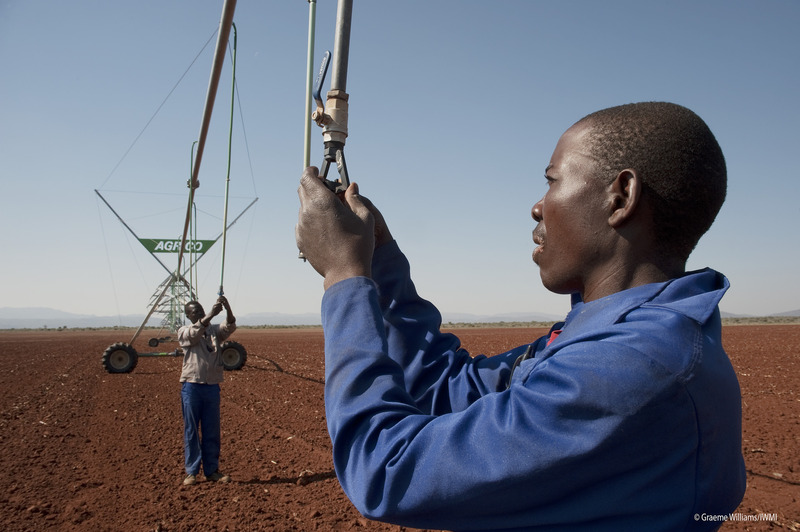 Irrigation schemes in Southern Africa have an astounding rate of failure. A new report, released by the International Water Management Institute (IWMI), looks why this is and what factors need to be in place to make these developments successful.The report was produced as a result of the project, Enhanced Regional Food security through increased agricultural productivity to sustainably reduce hunger, which was supported by USAID and WLE. In addition to the highlights above, WLE also works in this region on a range of other sustainable agriculture solutions. Here is the most recent content related to the region. Moyo, M.; van Rooyen, A.F. ; Chivenge, P.; Bjornlund, H. 2016. Irrigation development in Zimbabwe: understanding productivity barriers and opportunities at Mkoba and Silalatshani irrigation schemes. International Journal of Water Resources Development 33(5): 740-754. Bjornlund, H.; van Rooyen, A.F. ; Stirzaker, R. 2016. Profitability and productivity barriers and opportunities in small-scale irrigation schemes. International Journal of Water Resources Development 33(5): 690-704.